Munster bounced back from their opening day defeat to Edinburgh by coming from behind to claim a hard-fought Pro12 victory in Treviso. The home side took a 7-3 lead in the 19th minute courtesy of Simone Ragusi's converted try. But tries from from CJ Stander and Simon Zebo either side of the interval helped Munster take control. 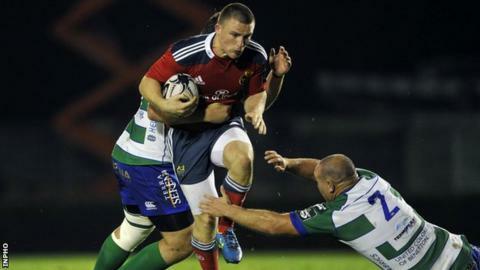 Fly-half Ian Keatley kicked 11 points as Anthony Foley's side clinched a morale-boosting victory. Foley's men had opened their campaign with a shock home defeat but they took an early lead through Keatley's penalty after the Treviso defence had strayed offside. Yet the northern Italian team, who were looking for an improved performance after a 44-13 mauling by Ospreys last Friday, hit back when Ragusi crashed over in the corner following good work from Ludovico Nitoglia and Cornelius van Zyl. Joe Carlisle added the extras but Munster narrowed the deficit to a solitary point soon after following Keatley's second penalty. The visitors then crossed the whitewash for the first time on the half hour, with Stander going over. Keatley converted the try, while Zebo extended Munster's advantage in the 51st minute following a fluid counter-attack down the wing after Treviso had lost possession. Treviso cut the deficit following a Carlisle penalty but Keatley added his third three-pointer to re-establish Munster's 11-point lead as they held on for victory. Treviso: Simone Ragusi; Ludovico Nitoglia, Luca Morisi, Sam Christie, Michele Campagnaro; Joe Carlisle, Henry Seniloli; Matteo Muccignat, Davide Giazzon, Rupert Harden; Marco Fuser, Corniel Van Zyl (Capt), Meyer Swanpoel, Tomas Vallejos Cinalli, Mat Luamanu. Not Used: Giovanni Maistri, Marco Barbini. Munster: Felix Jones (capt), Andrew Conway, Andrew Smith, Ivan Dineen, Simon Zebo; Ian Keatley, Duncan Williams; James Cronin, Duncan Casey, Stephen Archer; Dave Foley, Billy Holland; CJ Stander, Tommy O'Donnell, Robin Copeland. Replacements: Cathal Sheridan for Williams 69, John Ryan for Cronin 74, Kevin O'Byrne for Casey 78, BJ Botha for Archer 57, Donncha O'Callaghan for Foley 74, Sean Dougall for O'Donnell 75. Not Used: Johnny Holland, Ronan O'Mahony.